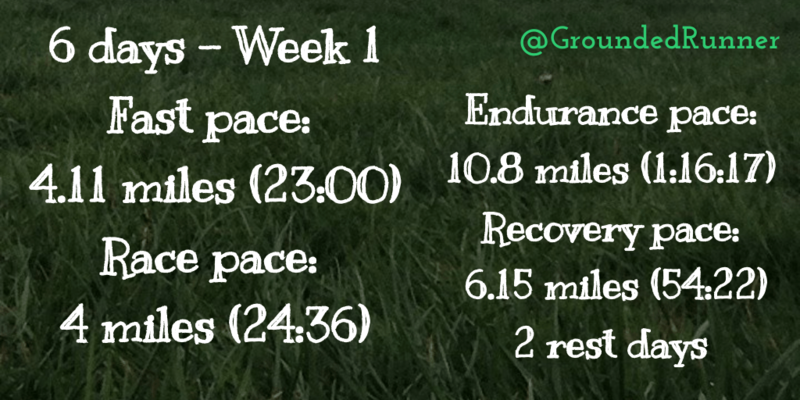 After last week’s success of breaking multiple personal records from ¼ mile to 2 miles my focus switched to endurance. My next race, 5 weeks away, is a local 10 mile race. So from Wednesday I began accumulating miles in preparation for my attempt at running under an hour, equivalent to less than 6:00 per mile pace. I intended my first workout of my 10-mile training (on Wednesday 4 April) to be a 10k time-trial. However, after a mile at race pace* I realised my legs had not fully recovered from my mile time-trials so after another mile at race pace I altered my workout. Instead, I completed a 1-mile jogging recovery**. Then I ran another two miles at race pace. Although I did not accomplish what I originally set out, I modified it to reflect my current fitness level. I therefore accumulated 4 miles in the pace range I desired as opposed to 2 miles (as my pace would have progressively slowed if I had not had a recovery). The workout proved to me that runners need to prioritise the overall purpose of a workout (in my case to accumulate as many miles at race pace) rather than any preconceived plan. As a result training will be maximised. On Thursday (5 April) I ran a quality session*** with my running club. As there is a greater amount of daylight I chose to run in my black running jacket. I led the session from the start, running 2,3,4,5,4,3 and 2 minutes quicker than race pace with half the time of the intervals as jogging recoveries. One coach called me the ‘Black Assassin’, later the ‘Silent Assassin’. More important than obtaining another positive nickname is the observation that my forefoot strike in my Vibram FiveFingers barefoot shoes is quiet. This suggests the lightness on my feet has transferred to efficient speed. This style of running feels so natural to me that my calf muscles are fatigue resilient. The nickname reminds me of the hard work I have made with calf raises and committing to barefoot shoes. I also ran 4.4 miles on Friday and 6.4 miles on Sunday 30-90 seconds slower per mile**** than race pace to build my endurance. My rest days were Tuesday and Saturday. * An appropriate pace range for me to support my race pace goal is 6:00-6:30 per mile. ** My recovery pace (including warm-up and cool down) is any pace slower than 9:00 per mile. *** Interval training for me is any pace faster than 6:00 per mile. **** This is equivalent to 6:30-8:00 per mile.